• LA Signature's Party, Office Snack Pack include Variety of 60 delicious individually packaged single serve snacks. Huge Party Snacks pack includes snacks for everyone for any occasion. 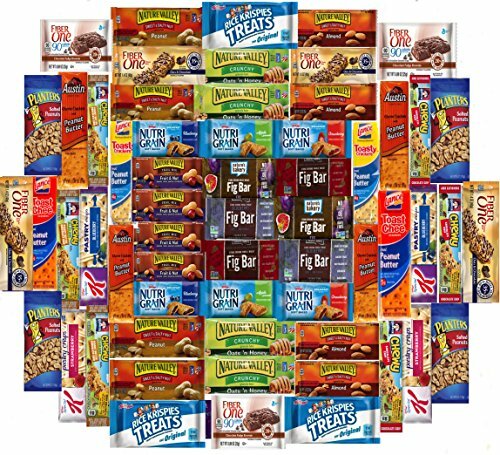 This Huge Party Snack Pack Include 60 Healthy Snacks include; 6 Fig Bars; 6 Kellogg's Nutrigrain Bars; 4 Nature Valley honey Oats; 4 Nature Valley Trail Mix; 4 Nature Valley Sweet & Salty Peanut butter; 4 Nature Valley Sweet & Salty Almonds; 4 Fiber One Oats & Chocolate; 3 Fiber One Chocolate Fudge Brownies; 4 Kellogg's Pastry Crisp; 3 Kellogg's Rice Krispie Treats; 3 Quaker Chewy Chocolate Peanut Butter; 3 Quaker Chewy Chocolate Chip; 2 Lance Toast Chee Cracker Peanut Butter; 2 Lance Toasty Crackers Peanut Butter; 4 Austin Cheese Crackers with Peanut butter Cookies; 4 Planters Peanuts. LA Signature's Party, Office Snack Pack include Variety of 60 delicious individually packaged single serve snacks. Huge Party Snacks pack includes snacks for everyone for any occasion. The best and most tasty snacking choices for you in this pack. Packed full of Healthy Snacks, Low Carb, Non GMO, Low Calorie and GF options. Care Packages contents will always be fresh, convenient, and ready to go. For runners, athletes, body builders, diabetics, health conscious, cyclists, athletic and fitness trainers. Makes thank you baskets, thinking of you, and I miss you.